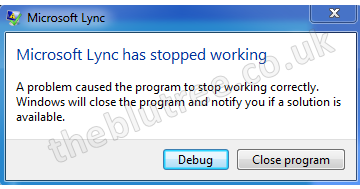 A couple of roaming staff received this error after rolling out Lync 2013 basic client onto their laptops. The only thing in common was they were both roaming staff with laptops. After about 20 minutes or so working on one of the laptops I noticed that there was a laptop dock software installed so the laptop could connect to two monitors. I read on Google that the error may be down to the Graphics drivers so I uninstalled the dock software and it worked fine. The dock software installed its own graphics drivers for the dual monitor which were in compatible with Lync. Downloading the latest software from the manufactures website allowed the dock to work again with Lync as well. I checked the other laptop and they also had similar software installed removing and updating the software fixed the issue there also. We have been using SCCM 2012 (System Center Configuration Manager 2012) for a while and every time we add a workstation to the domain the SCCM client and endpoint protection is installed automatically. Recently there was an issue where the client would not automatically install. The only difference from all other workstations was that this was a MacBook Pro with a virtual instance of Windows 8.1 Pro (using VMware Fusions v7). The VM was on the domain and I could not find the reason why the client would not install. I ended up having to install the client manually. 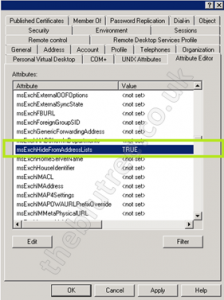 SCCMServerName – Replace this value with the hostname of you SCCM Server. While testing the migration to office 365 I found that once a test mailbox had been migrated and I set up an account on my iPhone 4s (firmware version 7.1) I could not send emails. It worked fine with our on premise Exchange server 2010 account. I was creating and sending the emails and it was no longer in the outbox. The emails were never received and they did not appear in the sent Items. It turned out that there was a bug in the firmware and once I upgraded to version 7.1.2 it worked fine. If you are on version 8 of the firmware it was working fine on version 8.02. After migrating a shared mail box to office 365 from an on premise exchange server I received the following bounce message in outlook when trying to send emails as the shared folder. i.e. send emails as sales@mydomain.com. First of a checked permissions and the users permissions had copied over. They had full access and send as permissions to the shared mailbox. I logged into the outlook portal and the email worked fine which made me think the issue was with the outlook profile. I re-created the profile and the issue still remained. The operation on mailbox “(Shared mailbox)” failed because it’s out of the current user’s write scope. 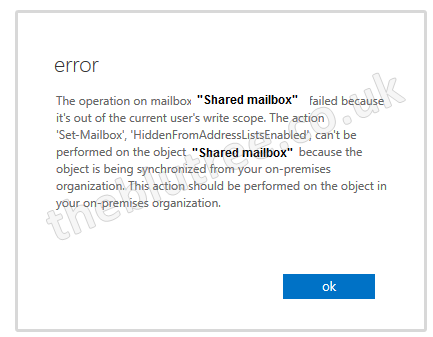 The action ‘Set-Mailbox’, ‘HiddenFromAddressListsEnabled’, can’t be performed on the object ‘(Shared Mailbox)’ because the object is being synchronized from your on-premises organization. This action should be performed on the object in your on-premises organization. 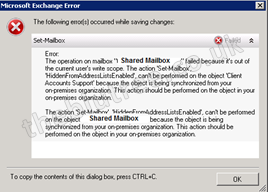 The operation on mailbox “Shared Mailbox” failed because it’s out of the current user’s write scope. The action ‘Set-Mailbox’, ‘HiddenFromAddressListsEnabled’, can’t be performed on the object ‘Client Accounts Support’ because the object is being synchronized from your on-premises organization. This action should be performed on the object in your on-premises organization. The action ‘Set-Mailbox’, ‘HiddenFromAddressListsEnabled’, can’t be performed on the object ‘Shared mailbox’ because the object is being synchronized from your on-premises organization. This action should be performed on the object in your on-premises organization. Set the value to FALSE and sync the changes up using the DirSync tool. Once complete wait a few minutes then restart outlook (or download the address book changes) and it should work fine.